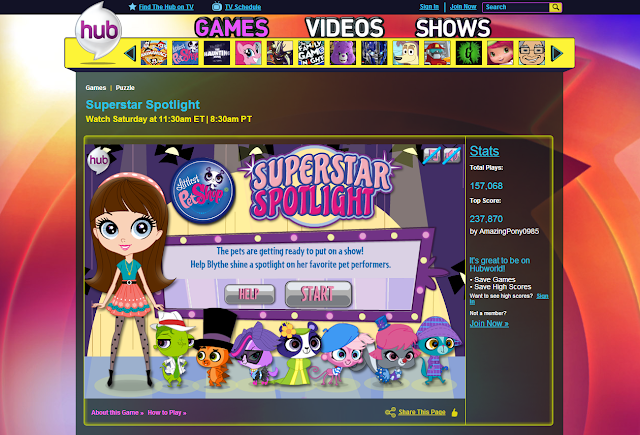 The Pet Shop Insider: New LPS Game on Hubworld.com: "Superstar Spotlight"
New LPS Game on Hubworld.com: "Superstar Spotlight"
It doesn't look like we're going to get a promo or clip from tomorrow's episode, but we do have a newly released online game on Hubworld.com, "Superstar Spotlight", apparently the first game on the site to include this generation of LPS. The basic idea of this game is that you are given a certain number of seconds to memorize where on the screen some of the LPS pets are located, and then, once those seconds are up, you need to locate where on the now-black screen one certain pet was. You can click on the black screen, and a certain color dot will appear where you clicked; the color meter at the top left of the screen lets you know if you're "Hot" or "Cold" in relation to the location you're looking for, but you only have a certain number of clicks for the whole game! If you get really stuck, you can click on the Hint button that appears when you have less than 5 clicks left. Complete all 5 levels to win the game!